In the interval between Ethelbert's defeat by Ceawlin and the arrival of the Roman missionaries, the death of the Wessex king had left Ethelbert, at least virtually, supreme in southern Britain, and his baptism, which took place on Whitsunday next following the landing of Augustine (2 June, 597) had such an effect in deciding the minds of his wavering countrymen that as many as 10,000 are said to have followed his example within a few months. 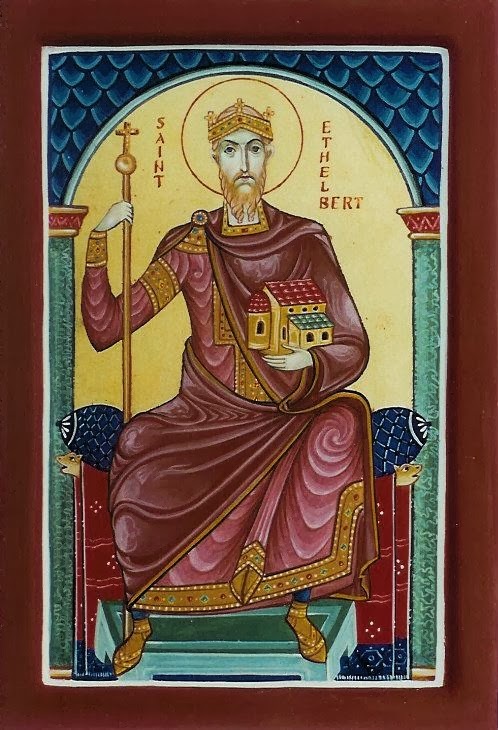 Thenceforward Ethelbert became the watchful father of the infant Anglo-Saxon Church. He founded the church which in after-ages was to be the primatial cathedral of all England, besides other churches at Rochester and Canterbury. But, although he permitted, and even helped, Augustine to convert a heathen temple into the church of St. Pancras (Canterbury), he never compelled his heathen subjects to accept baptism. Moreover, as the lawgiver who issued their first written laws to the English people (the ninety "Dooms of Ethelbert", A.D. 604) he holds in English history a place thoroughly consistent with his character as the temporal founder of that see which did more than any other for the upbuilding of free and orderly political institutions in Christendom. When St. Mellitus had converted Sæbert, King of the East Saxons, whose capital was London, and it was proposed to make that see the metropolitan, Ethelbert, supported by Augustine, successfully resisted the attempt, and thus fixed for more than nine centuries the individual character of the English church. He left three children, of whom the only son, Eadbald, lived and died a pagan.